Published Dec. 18, 2018 at 7:56 p.m.
Milwaukee may not be known for its hot weather, but that doesn't mean that the Brew City can't bring the heat – namely from the kitchen. That's why Senior Developer Nick "Power Palate" Barth and Culture Editor Matt "Powder Puff Palate" Mueller are on a journey, burning their buds and torching their tongues across town to find the city's spiciest dishes. Grab your fork and a fire extinguisher – this is Burning Through Brew City. After a month-long hiatus, Burning Through Brew City is back from the dead – and heading to one of the city's most haunted locales, just in time for the spooky, scary, ghoul-filled holiday of ... Christmas? (*glances at calendar*) How is it already Christmas? I could've sworn it was October a day ago. Time moves too fast. Remember when the Winter Olympics were this year? Calendars are lies. Plus, it's always a good time to visit Shaker's Cigar Bar, one of Milwaukee's most famous venues while also, I would argue, one of its most underrated. Maybe the idea of drinking next to a dead person's ghost spooks people away. Or maybe it's the cigar bar part of its name – which it certainly lives up to, from the cigars on the menu to the scent of flavorful smoke wafting throughout the space. But Shaker's feels oddly unappreciated considering its national notoriety, delivering much more – warm atmosphere, a tasty menu, special craft brews and unique cocktails – than just a bar with a ghost gimmick. That being said, obviously much of that notoriety comes from its supposedly haunted quarters – a reputation that earned it a place on Netflix's terror-filled travelogue, "Dark Tourist." The show mostly focused on the bar's Cream City Cannibal Tour, which focuses on tracking the steps of infamous serial killer Jeffrey Dahmer, but Shaker's itself has quite the queasy history. The most famous tale of terror involves a woman of the night named Molly Brennan who was murdered by a childhood friend turned jealous suitor in the third-floor penthouse back when the Shaker's space was a brothel back in the 1920s. As the story goes, that friend would go on to be murdered himself – supposedly by someone involved with famed gangster Al Capone, who ran the place back in the day. Now, the two haunt the penthouse space – which seems like a rough deal for Molly. If I had to spend my afterlife with my own traitorous murderer, I'd cause supernatural shenanigans too, like moving shoes or causing fiery hallucinations. If that all sounds like spooky nonsense, in 2001, Shaker's actually found approximately 70-year-old human bones under the penthouse's floorboards. So this may not just be some urban legend. And that's just one of the handful of supposed specters making an extended stay at the cigar bar. But Nick and I didn't drop by for scary stories. We dropped by for a supposedly scary taco: the jammin' jerk pulled pork taco, starring a "mystical" mango habanero sauce that helped the dish win TacoFest 2018's judges choice for best taco. With a resume like that – and a rich, old-school setting like Shaker's – how could we resist? Well, yes, the presence of potentially vengeful ghosts, but if we can handle ghost peppers and Carolina reapers, surely we can handle a few pesky phantoms! So would these tacos give our taste buds nightmares? Let's find out! Nick: We talk about above/below the Milwaukee Hot™ line a lot, but I think these tacos actually sit on the line – hot enough to be labelled spicy in order to scare away people to who don't like it hot, but not enough to satisfy people specifically looking for spicy food. The mango habanero sauce (as well as the pulled pork) has enough fat to counteract the direct sharpness of the habanero, leaving good flavor but little bite. Matt: With all the ghosts allegedly holding court, there's plenty of things to be scared of at Shaker's – but this taco ain't one of them. 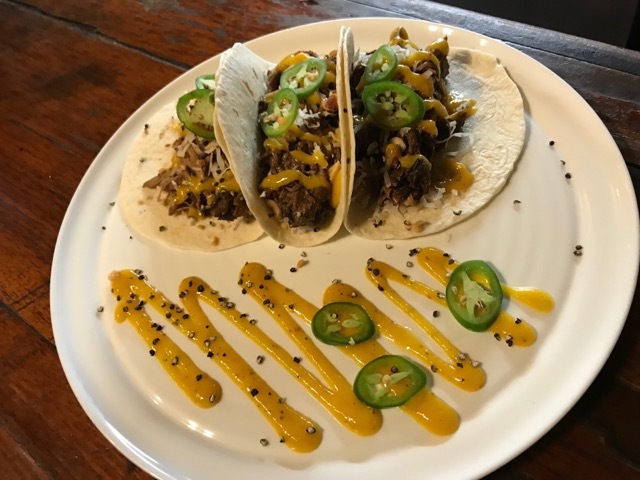 The mango habanero sauce focuses more on sweet balance than singeing burn, and between the chewy soft taco, the unctuous and meaty pulled pork, and the nutty toppings, there's plenty to cushion the blow of the sauce and the thinly sliced peppers on top. Unless your particular order were to be possessed by the spirit of a particularly angry ghost pepper, you're got nothing to fear. Nick: None really to speak of. There's a mild mouth burn while you're eating, but it's gone before the check arrives. Matt: I felt a little bit of belly burn after our meal. Might've been the habaneros resting in my stomach. Also might've just been butterflies in my stomach due to the haunted setting. Still, either way, this is no terror for your tummy. Nick: While the tacos are a little lacking in the heat department, they excel in taste. The pulled pork has the perfect chew and not-overbearing jerk flavor. Shredded coconut and chopped nuts add texture contrast without crashing the party like a pile of cabbage or onions often does. Though I was a little disappointed by the mild heat (given our stated heat-seeking quest), I can't deny the fact that the mild heat is in balanced accompaniment to the rest of the taco. Matt: Just because these tacos don't score high on our heat thermometer doesn't mean they don't pack flavor. The pulled pork is fatty and luscious, with the sauce providing just the right blend of sweet and spice. But the not-so-quiet star here is the shredded coconut and chopped nuts on top, which not only add a delectable crunch to cut through the chewy mix but also add a layer of sweetness (with the coconut) and savory (with the nuts). Nick: I assume the jammin' jerk tacos won TacoFest for doing everything right. There's just the right amount of everything: flavor, texture, heat (for most ... sigh). Even the three-taco portion ($13.50) is in line. They were colorful and beautifully plated. For a great taco, try Shakers – but if you're looking for terrifying heat levels, this ain't it, chief. Matt: Sure, the jammin' jerk tacos aren't all that spicy, the habanero adding more of a subtle, fruity sizzle rather than an overwhelming fire. But I have been truly haunted by these tacos ever since tasting them during our visit. It's such a unique yet delicious creation, the fatty and flavorful pulled pork playing perfectly with the tangy sauce with a touch of a heat – all matched with the chopped nuts and coconut shavings on top, adding an unexpected pop of crunch to the meaty, chewy proceedings. Even the plate looked special, jazzed up with a gorgeous garnish of the sauce swizzled onto the dish. There's a number of places to find a tasty taco in Milwaukee; this one, however, is special and one of a kind – almost as special and one of a kind as the venue serving them. I've been possessed by the idea of these tacos ever since – and lucky for me, the only way to exorcise them out of my system is to go back and get another order.